Find names and contact information for staff members who work at UC San Diego's Academic Enrichment Programs (AEP). David Artis, PhD, Dean of Undergraduate Research Initiatives, came to the Office of Academic Enrichment Programs (AEP) in November, 2000, from the University of Michigan, Ann Arbor. There he had served as a faculty member, graduate school administrator and Director of Academic Services in the School of Public Health. At UC San Diego, he has overseen steady growth in the number of AEP programs and services, including coordinating more scholarship opportunities for students in all fields, increased participation in AEP sponsored undergraduate research conferences, and more collaborative program efforts with other campus units. He is a graduate of Yale and Stanford. Veronica Bejar is the assistant director for the Academic Enrichment Programs and McNair Program. She has over thirteen years of experience preparing and encouraging talented students to pursuing post-baccalaureate degrees. As the Assistant Director, Veronica assists the ongoing operations of the AEP academic year programs, conferences, and summer research programs. Kirsten Kung works with a number of students through the Academic Enrichment Programs office. She has extensive experience coordinating multiple year research programs and helping students experience opportunities outside of the classroom. She is particularly interested in issues related to mentoring, engaged learning, and research ethics. She received her Ph.D. from the Ohio State University in Social Psychology with minors in Health Psychology and Quantitative Psychology. Prior to coming to UC San Diego, she was a faculty member at the University of Houston. Jessica Davis is the Triton Research & Experiential Learning Scholars (TRELS) Coordinator, and previously coordinated the Faculty Mentor Program (FMP) as well as several undergraduate research conferences on campus. After transferring from community college, Jessica earned both her B.A. and M.A. in Philosophy at San Diego State University. She earned her Ph.D. in Philosophy and Education from Teachers College, Columbia University. Thomas K. Brown has been the Coordinator of the UCSD McNair Program since December of 2005. He has earned advanced degrees in chemistry (C.Phil, Caltech) and anthropology (Ph.D., UCSD). In his role as McNair Program Coordinator he helps students find research placements with UCSD faculty. The McNair Program is a preparatory program for traditionally under-represented students (first-generation college students from low-income households and those from under-represented ethnic groups) who want to earn a Ph.D. in any field. Adele Savage is a health care career guidance specialist and is the coordinator of the Health and Medical Professionals Preparation Program (HMP³) at the University of California, San Diego. The position is significant to UCSD’s mission of preparing more undergraduates, including underrepresented minority students, for health and medical professions. Adele has a Master’s degree in Guidance and Counseling, 15 years of experience in women’s health education, and has been the coordinator of HMP3 at UCSD since 2002. 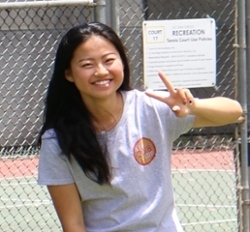 Sophia Tsai coordinates multiple programs within the Academic Enrichment Programs office. She has experience coordinating student-mentor matching, research scholarships, and helping students get more out of their research programs. She received her Ph.D. from the University of Southern California (USC) in molecular biology doing x-ray crystallography, and her Bachelor of Science at University of California, Los Angeles (UCLA) studying Cybernetics with an emphasis on Bioinformatics. Prior to coming to UC San Diego, she was a postdoctoral scholar at UCLA. Diana Laura Morales is a first-year sophomore here at UC San Diego from Revelle college with a declared major in Cognitive Science specialized in Machine Learning and Neural Computation. Diana says, "I remember getting lost trying to find the AEP office my first time so don't worry if you get lost. Working at AEP I have had the opportunity to meet inspiring students and staff that I aspire to be like and have found an interest in research. I feel fortunate to say I enjoy working at AEP because I feel supported, welcomed and motivated by my colleagues." Jing Shi is a junior here at UC San Diego with a declared major in Joint Mathematics and Computer Science. Jing says, "Working at AEP has allowed me to stay inspired by my diligent peers and their passion for research. I feel fortunate to be a part of this team in supporting undergraduate research."